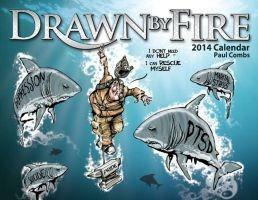 Paul Combs-an 18-year veteran firefighter and award-winning illustrator-has created a wall calendar for 2014! The new calendar features 12 editorial cartoons selected from Paul's illustrations published throughout this past year in Fire Engineering magazine, as well as his Fire Engineering blog. Lieutenant Paul Combs is a 18-year veteran firefighter for the City of Bryan (Ohio) Fire Department, where he is a Firefighter II, NREMT-B, Fire Officer I, Hazardous Materials Technician, and Ohio Fire Instructor I for the City of Bryan Fire Training Academy. In addition to being a firefighter/EMT-B, Lt. Combs is a classically trained artist and award-winning illustrator. This unlikely combination has made Paul one of the most compelling and distinctive illustrators in America today. Paul burst onto the scene with a refreshing new style that married classical realism, manic energy, and a zany imagination for caricature. His lavishly detailed illustrations are published worldwide in magazines (print and online), newspapers, and books.